I know it is a long time since I have posted a juicing blog post but we are still juicing everyday. Above, Aaron eating a whole bowl full of grapes. I was glad for two reaons (1) because he hasn't in ages and (2) it is the first time ever that he has not made me peel them! 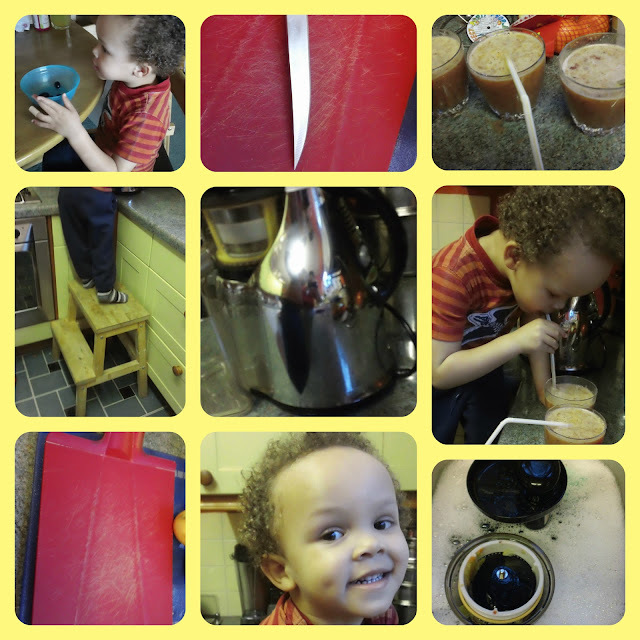 In the above collage I am showing you some of the things you'll need for juicing with a two year old. The stool is over 10 years old from Ikea and is ideal. A chopping board and sharp knife. Aaron is always near the machine and I chop and pass him all the pieces. He then feeds them into the machine. The best thing to do after is dump all of the parts immediately in hot soapy water and always have it clean and ready to go and out on the work top so that you use it often. Aaron had a quarter of a tumbler where he'd normally drink the whole glass and I think it was because it is the first time we've add blueberries. I think because they are a super food he didn't need quite as much juice as normal. I love juicing because Aaron REALLY loves it, and it is a great way of sneaking carrots into him, and helping get him to his five a day. Regular readers will remember that I bought my juicer at the end of last Summer. That all looks incredibly yummy - and healthy too! Hello, I checκ yоur new stuff liκe еvery weеk. Your writing ѕtyle is witty, κeep it up!